Posted by David Boyce in NECA, Review, Video Games with 0 comments. Let me start off by stating I won’t say anything cliche at the beginning of a Contra article such as: Up, Up, Down, Down, Left, Right, Left Right, B, A, (and maybe Select), Start. I won’t mention that famous cheat code that would grant players a plethora of lives across multiple Konami games of the past, and popularized in the run and gun commando shooter: Contra. I’m not going to explain how its a love letter to 80’s action movies with the perfect blend of action and platforming. Or will I not say — okay okay, Contra is absolutely amazing and still holds up as I actually ran through it again last week. It’s not uncommon to see the game in a lot of top 10 lists for that era. It also helps being inspired/lifted by great movies such as Rambo, Aliens, and Predator right down to the box art itself. Oh and how convenient! NECA has the rights to all those properties too! This was obviously a no-brainer for their ever expanding ‘Video Game Appearance‘ line. The VGA line is a celebration of classic video game characters, as well as an excuse to resell a figure with a wildly different paint app. I don’t use that as a pejorative, though, because NECA’s paint-apps are some of the best and it has become one of my favorite toy gimmicks. The style they go for with these guys is a hard pixelation look on their pants with washed out whites on their skin to replicate the old NES sprite look. A gripe among fans when they were first shown was that the color palette is backwards, Bill is blue while Lance is red. 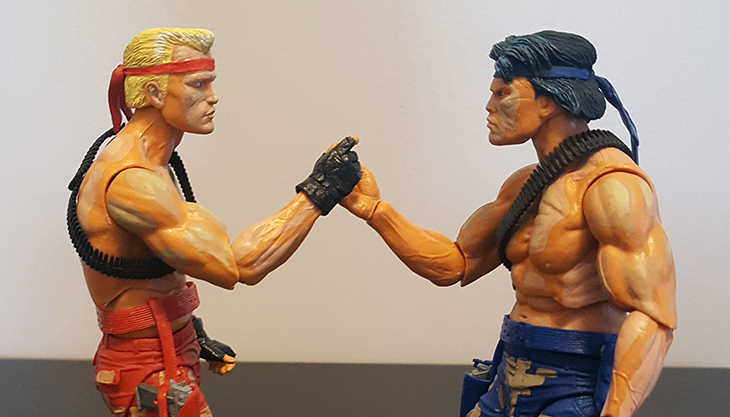 NECA ended up keeping it this way and honestly it isn’t such a big deal, but if it is a simple head swap and some slight paint touch ups on the bandannas and you are good to go. Speaking of customs, Predator fans can also rejoice at the fact that Lance’s head looks an awful lot like Billy from Predator. With NECA figures being huge in the modding community it wouldn’t surprise me at all if this was intentional. A few touch ups with some paint along with a swap on a spare Dutch body and you’re good to go. – They both have a pistol and knife with a belt to hold them. – Bullet effects for both guns in the form of spread shot and machine gun. – A power up blimp. – A separate bigger spread shot effect. If you’re like me and actually want to hold on to the box for display purposes it’s the same size as the VGA NES Godzilla box. Bigger than the standard single figure but smaller than the deluxe sized Gremlins 2 box. The rifles are highly customizable in the fact that you can mix and match the barrels and stock. The bullet effect can also be stacked on top of each other as well for several different looks. The hands however aren’t really made to hold their knives and they just awkwardly lay in their hands, but then again when have they ever used knives in the game? Note: Don’t be that guy that butts in and says something to the effect of “in level eight of Contra Force you pick up a knife.” No one likes that guy. NO ONE! To think these figures almost didn’t get made. First shown off in December 2015, then NECA went on to have communication issues with Konami, giving them the go ahead and then months of stalling final approval for no apparent reason. If you have read anything in the past few years about Konami and all the internal fighting the company has had with its video game division, this shouldn’t come as a shock. There is also an NES repaint of Simon Belmont that was shown off at this past Toy Fair but after the headache it was to release the Contra set, it may never see the light of day. So if you are a fan of Contra or the VGA line in general I highly recommend this set not only for the amazing product,but to ensure more figures of this style down the line. This box set is currently available to purchase on Amazon or Entertainment Earth. I’d say get it sooner than later, because these one-off releases tend to trend upward in price once they are out of print. Plus, how likely is it we ever see figures from Contra again?